Our product range includes a wide range of non metallic asbestos webbing tapes, industrial asbestos webbing tape and asbestos webbing tape for coil winding. Non Metallic Asbestos Webbing Tapes are fireproof, flexible tapes woven from 100% pure asbestos "Yarn" that will not unravel in service. We offer a wide range of asbestos webbing tape that are manufactured using woven around asbestos yarn that does not loosen while service. These yarns are made using technically advanced materials in compliance with international quality standards. Further, these Asbestos Webbing Tape has excellent electrical and heat insulating properties and high tensile strength. Also, they are durable and economical, high in water repellent, low in water absorption, resistant to flame, heat, oil, fungus and mould, non-corrosive to cables, non-sagging and abrasive resistant. Asbestos Webbing Tapes are used for insulating wires, coils, cables and other electrical conductors. Further, these form flexible connecting couplings where high temperature services are involved; and as winking in oil-burning apparatus. 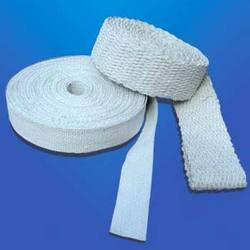 Industrial Asbestos Webbing Tape offered find application in sealing components that are used in manufacturing equipment. These are capable of handling high temperature instrument and heat and fall in compliance with international standards. Further, these asbestos webbing tapes also come with superior excellent electrical & heat insulating properties. 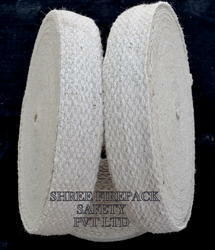 Asbestos Webbing Tape is used for Coil Winding. Our range of Asbestos webbing Tape offers consistent services for longer period of time and is used in heavy machinery industry. Because of their excellent electrical and heat insulating properties and high tensile strength this asbestos webbing tape comes open up a new horizon of applications. Edges of the webbing tape are selvaged so that the threads cannot pullout. Asbestos tape are handy and so can conveniently be carried anywhere at anytime and used right on the spot of work. Looking for Asbestos Webbing Tapes ?